From Goodreads.com: Helen Banks is going to die. 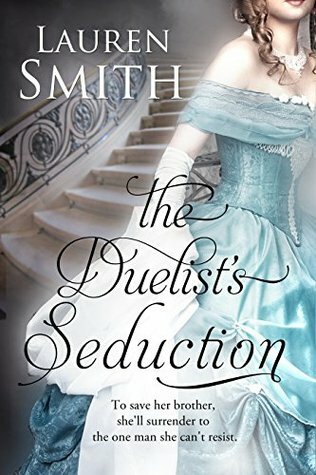 When her twin brother gambles away their fortune, she must save his life and take his place in a duel to satisfy the honor of a man her brother couldn’t pay. Disguised as her brother, Helen faces the one man she’s admired from afar, a widower with a dark past and eyes that scorch her very soul. Since Gareth Fairfax lost his wife, the darkness in his heart continues to grow. Lashing out at anyone who opposes him, Gareth is stunned to face a lovely young woman opposite his dueling pistol. After discovering Helen’s deception, he offers her a choice: become his mistress or her brother dies. Their devil’s bargain turns into a slow, sweet, intoxicating seduction. With each passing hour, Helen uncovers Gareth’s secret heartbreak and yet she can’t help but fall for the man who has ruined her. With Helen in his arms, Gareth wonders if he might yet be saved. All it takes is one passionate embrace, a kiss from the depths of his soul and a night of wild abandon. I'm usually not a fan of "instant love" stories. In fact in most cases I hate them. I can completely understand "lust at first sight" and being "passionate" about someone, but when you go from virtual strangers to being "in love" over the span of a few days? That I don't buy. However - this was a cute read (once you get past the brutish way Gareth first treats Helen). I enjoyed watching her make him feel alive again, and their interactions with each other. From horseback riding to tree climbing, you could see how well these characters complimented one another, and I was thoroughly entertained by their story. Overall, I would recommend this story to anyone who likes a quick read full of cute moments and decent characters.